This sauce is bold and very, very tasty. It does, however, take the lead over the flavor of the salmon, so if you want your primary flavor to be salmon flavor perhaps go with a little drizzle of olive oil and sprinkle of salt instead of this marinade/sauce. I'm a big fan of bold flavors so I love this one! We will have tubs of this pre-made to offer with the silver salmon steaks if it's "steak week" for those of us that enjoy convenience and time-savers. It's an excellent meal that everyone is sure to love and it makes your kitchen smell like gingery, garlicky heaven. YUM. In a small bowl, combine the ginger, garlic, sesame oil, soy sauce and brown sugar. Stir until the sugar is dissolved. Place your salmon steaks in a bowl or plastic bag and pour half (about 4T) of the marinade on the salmon. (Reserve the remaining mixture to make a drizzling sauce after the salmon is cooked.) Marinate for at least 15 minutes, and up to several hours - the longer the time, the more the flavor of the sauce will infuse into the salmon. We like to serve this over rice, so the first cooking move I make is to put a pot of rice on. I cook 1 1/2 cups of calrose rice in two cups of boiling water for about 20 minutes on low. Then, light your coals or pre-heat your grill! I like to pour a little bit of cooking oil on a paper towel and wipe the surface of the grill to help keep the salmon from sticking - a spritz of non-stick spray will work for this, too. 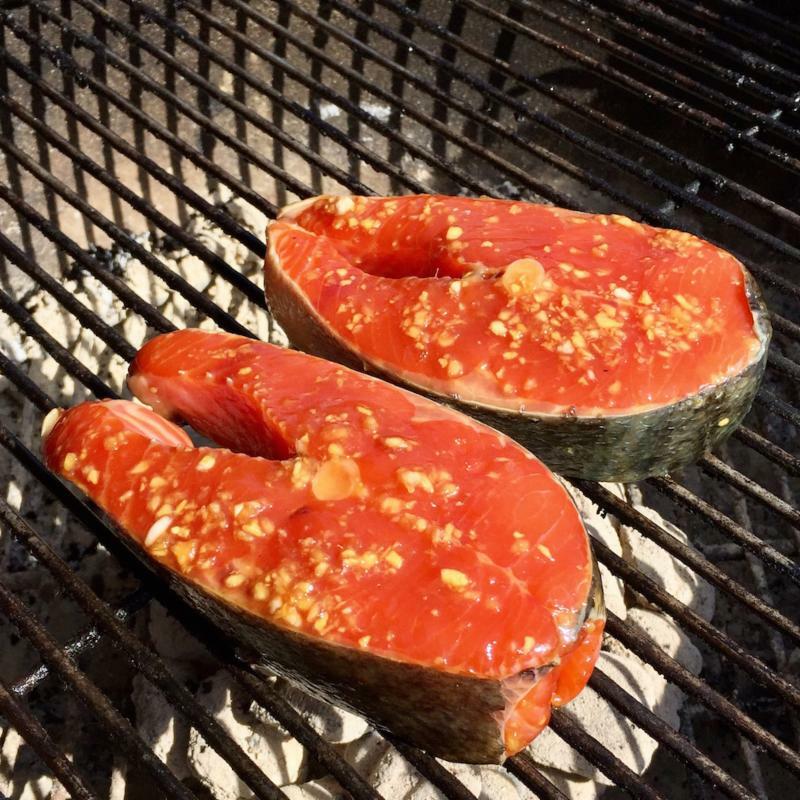 With a pair of tongs, remove your salmon steaks from the marinade and place on the grill. Cook for 3-5 minutes, then flip with the tongs and cook on the second side for 3 minutes more. 10 or 15 seconds. It will reduce a bit and turn into a super delicious teriyaki-ish sauce of sorts. Place a generous spoonful of rice in the center of a plate, top with the salmon and then drizzle with the cooked sauce. Sprinkle with sesame seeds and minced green onion. Serve with a green salad and a cold Sauvignon Blanc or sake - enjoy!